Pelage: Hair only on fringes of ears, and tip of tail. Thick, gray, heavily-folded skin covers the body; color often obscured by dirt. Horns: Two; located on the rostrum. Composed of keratin (protein composing hair); no bony core. Not shed annually. Diagnostic Characters: Upper lip pointed and prehensile, capable of grasping objects; unlike the White Rhino whose lip is squared-off and non-prehensile. Range: Widely scattered populations, Sub saharan Africa. Most commonly present in Kenya, South Africa, Zimbabwe, and Namibia. Habitat: Savannahs; not found in closed canopy forest. Locomotion: Tend to be fairly sedentary. Share established trails with elephants. Activity Cycle: Active both day and night. Least active during hottest part of day (10 a.m. to 3 p.m.). Social Groups: Semi-solitary, but usually tolerate each other's presence with little aggression. Diet: Leaves and small twigs. Predators: Humans; young may be vulnerable to attacks by lions and hyenas. ​Heavily hunted for horns (for purported medicinal use); population decreased by 94% between 1970 and 1990. ​Earliest record of captivity- 3rd century BC by the Romans. Slow increase in population size since 1995 due to aggressive protection. 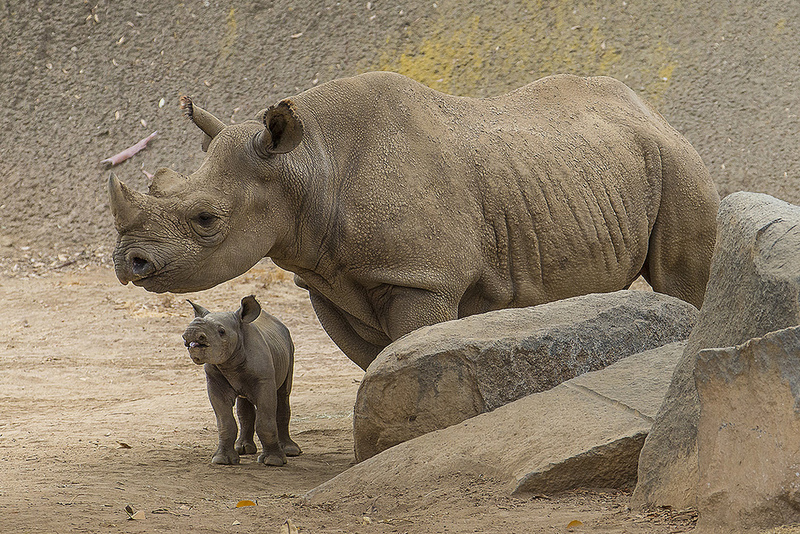 The SDZG is considered the world's leading breeding authority on rhinos. © 2003-2018 San Diego Zoo Global. Minor updates in 2013, 2015. Population estimates updated Sep 2018. How to cite: Black Rhinoceros (Diceros bicornis) Fact Sheet. c2003-2018. San Diego (CA): San Diego Zoo Global; [accessed YYYY Mmm dd]. http://ielc.libguides.com/sdzg/factsheets/ blackrhino.